I finally made it to the famous U2 Joshua Tree that's photographed in the art from their album of that name. 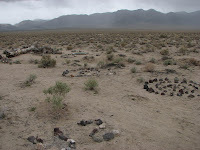 It's not in Joshua Tree National Park, but is instead just west of Death Valley National Park on a high altitude plain. Before you can ask, I'll confess that I did listen to the album on my way up the highway. I thought it'd be appropriate. To be honest, I don't like all the tracks. But I really like the first two: "Where the streets have no name" and "I still haven't found what I'm looking for". 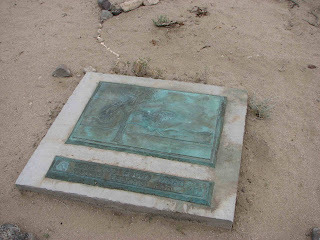 I have read several accounts online of people making pilgrimages to the site, and I've seen some nice photographs taken in the area (the best ones were in winter with snow on the ground). Last fall I tried and failed to locate the tree. I was very close, about 3 miles to the west of its actual location. 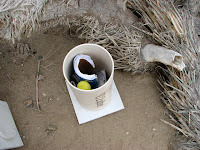 Here are a few links to such sites: This site is plugged by memorial material left at the tree. This site is easily found by googling. This guy has some nice photos showing the tree's progression as it died. The tree has become a memorial with visitors leaving albums, CDs, notes, and such. There's a concrete memorial plaque in the ground. I saw a guitar pick inside one of the tree's hollow branches. It's an easy walk from highway 190. As I expected, I didn't have to search for it, and was able to follow a lot of footprints in the sand. You can see from my photos that it was a cold and cloudy day. In fact, it had rained recently and it was still lightly sprinkling. 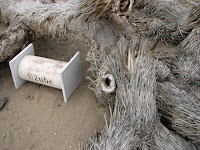 The tube labeled "U2ube" contains more memorabelia as well as a spiral notebook for leaving notes. I read a few notes. The last one was dated May 8th by "snow-nymph". She posts a lot of reports and photos from her adventures around the area. I'm not alone in my adventurous wanderings and I've come across the postings from her and many others who also like to wander out and visit the big outdoors. Were you able to drive up to the site or did you have to hike to it? Do you have GPS coordinates? It's a short hike. If you click on the linked word in the first sentence you'll get a google map. That shows the distance from the road to the tree. Thanks for the tip confirming the location. I've been wanting to do this for years, and all going well will be there in a few months. 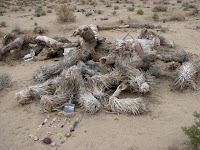 On 9.10.2009 we found the U2's Joshua Tree site. I have been on U2 360° Tour concert in Chorzow, Poland. As a big fan of the group and thanks to your post I add this Joshua Tree point as a must visit location on our one month trip on USA. It took me quite while to found out where the fallen tree is, but as I said your post helped. I'm glad you'll stop by the site during your trip. Even in the snow, it's a peaceful place in the middle of nowhere. Walked straight to it with your good coordinates and my Garmin GPS. Thanks! Glad it helped. I hope it's not become too messed up by visitors. I'd hate to return and find a Starbucks there. Thanks for the share, we found it. There' s stil no Starbucks, not even a direction sign or anything there that would make the search eady. It's just a wonderfull spot!